Each year amidst the hubbub created by the Chelsea Flower Show in London, a whole host of alternative garden-related events are taking place, some in little known places, others in more well known spots. The event is known as Chelsea Fringe and this year I will be taking part with Kim Winter of @flextiles in our other guise as Women of the Cloth. On 30th May, for just £10, from 10.00 a.m. until 2.00 p.m. you can come along and make either a needlefelted bird with me, or a wet-felted bird pod with Kim. Minimum age is 8 years and you will need to book directly with the venue South London Botanical Institute – places are limited, so don’t delay! Founded in 1910 in Tulse Hill, the Institute has a beautiful botanical garden and runs a wide range of courses, workshops and events for all ages. It’s a bit of a hidden gem. There will also be a Chelsea Fringe fair on 17th May at the Institute when a smaller taster session, needlefelting a ladybird, will be on offer in the afternoon. As usual, we will have a variety of work on show and for sale, with various guest textile artists adding yet more choice of work and techniques to see and to buy. Create your own carved lino block using traditional carving techniques. 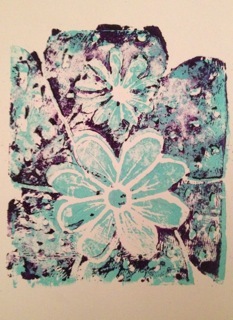 Print your design onto a tote bag and greetings cards. 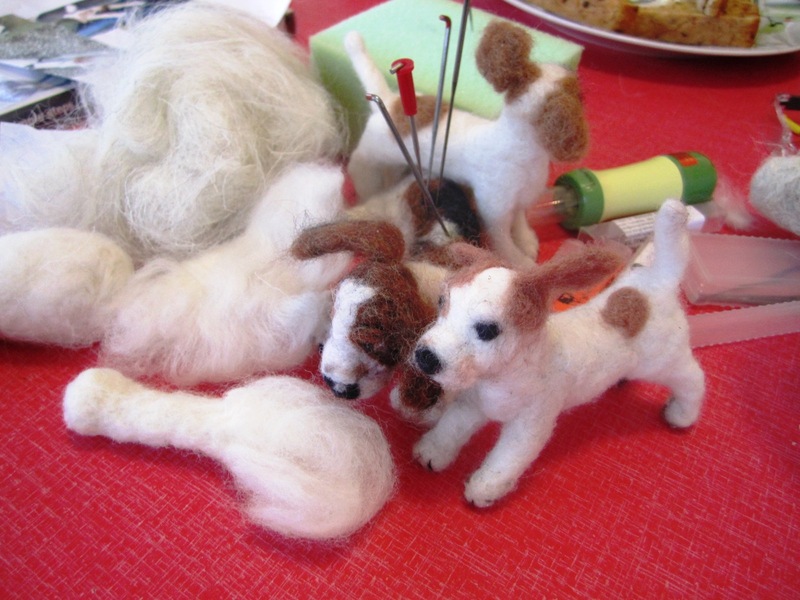 Needlefelting is flavour of the workshop month! This week the needlefelting needles have been prodding away at a furious pace. People seem to love it – it can get quite addictive when you begin to see the possibilities for adding detail to your creations. Between 10 am and 4 pm on Saturday, 24th August with Makerhood at the Southbankcentre’s Village Fair by the River Thames in central London some 40 people (could have been more as I lost count) sat down at my table to make needlefelted ladybirds. They all had great fun and couldn’t believe that a little barbed needle could turn a pile of dyed sheeps’ fleece into a solid object. It just takes a bit of patience and concentration – anyone can do it, even those who feel they have no creative ability. You do have to watch your fingers though, as the needles are very sharp! 8 year-old Lewis found this to his cost, but he carried on bravely and happily completed his beautiful Ladybird. It was a moment to savour as he was so proud of his creation. 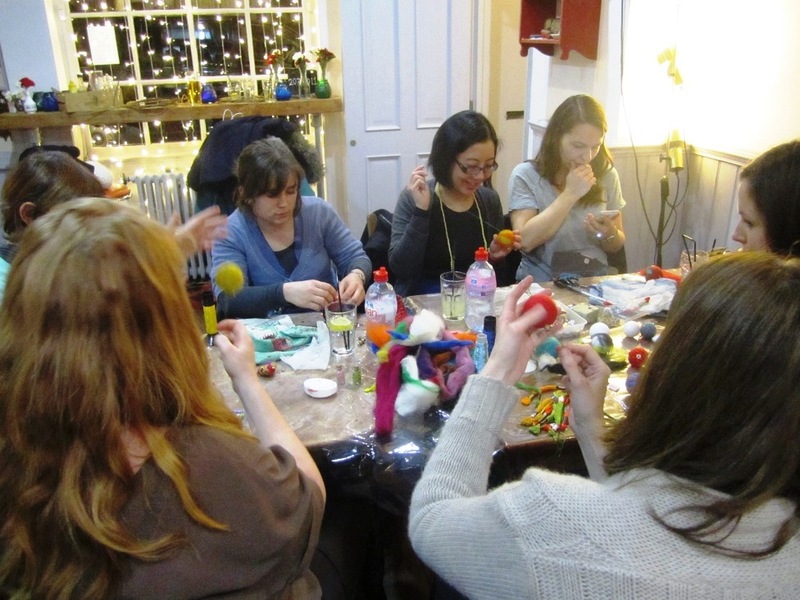 Another workshop this week involved local craft group Crafternoon at Serendipity Tea Room in Streatham, who make a flock of needlefelted robins, all with their own individual quirky characters! Finally, not technically a workshop, but at a large Bank Holiday family gathering at the home of keen kitchen gardener Penny, I found myself teaching the family’s youngsters needlefelting and not only was a Ladybird and a fieldmouse produced, but also some needlefelted carrots!! 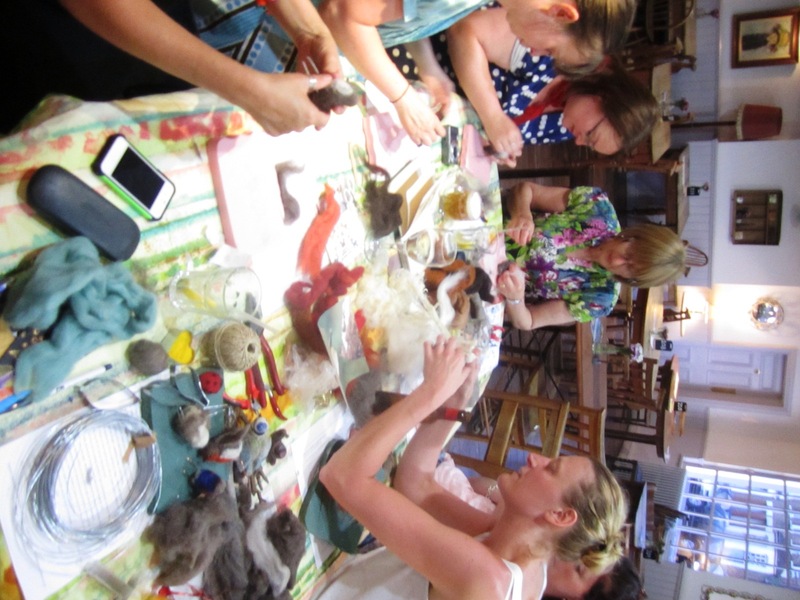 Next needelfelting workshop will take place on 6th October at my Lambeth Open House weekend with Women of the Cloth. Details of all Open House weekend workshops to come. 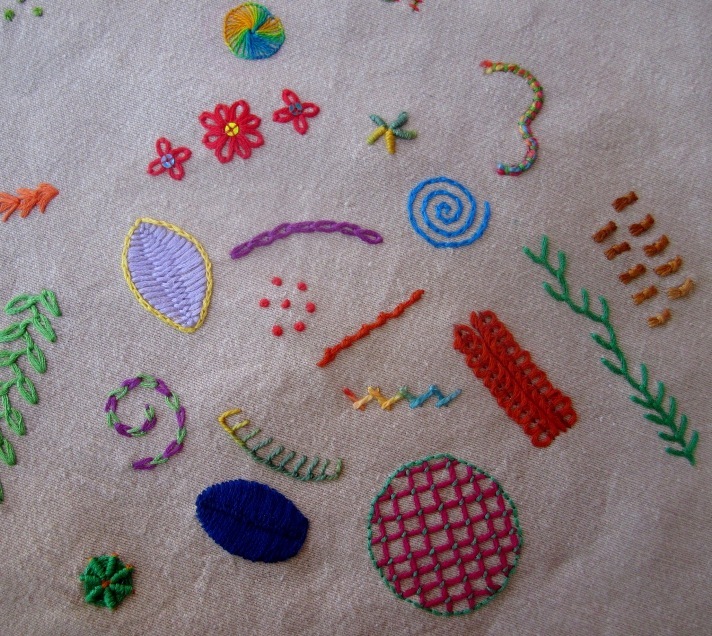 Posted in Dyeing, felt, Needlefelting, Wool, workshops | Tagged Lambeth, London, Makerhood, Needlefelting, textiles, wool, Workshops | Comments Off on Needlefelting is flavour of the workshop month! A summer of Workshop Fun! Choosing colours & eating biscuits! Then there was a felt fish workshop at Streatham Festival’s Make your own Fete at the Railway Pub, with Crafty Pint and Flaming Nora organising such a brilliantly creative day for what seemed like millions of local kids on a hot sunny day! I even got to take part in a workshop myself learning Willow Weaving with Crafty Pint tutor Geraldine. I absolutely loved it and took home four different finished items, all set to experiment with incorporating willow weaving into my feltmaking or vice-versa. Can’t wait to have some time to do that- I think my needlefelted birds are going to like the willow bird feeder! In between workshops, Kim Winter of WordPress blog Flextiles and I joined forces as Women of the Cloth for the Lambeth Garden Museum Summer Tumblr, which was a treat of a day spend in the knot garden in brilliant sunshine with lots of other artists/makers demonstrating our crafts and selling our wares. What a relaxing day we had in a beautiful place chatting with like-minded souls and interested visitors. 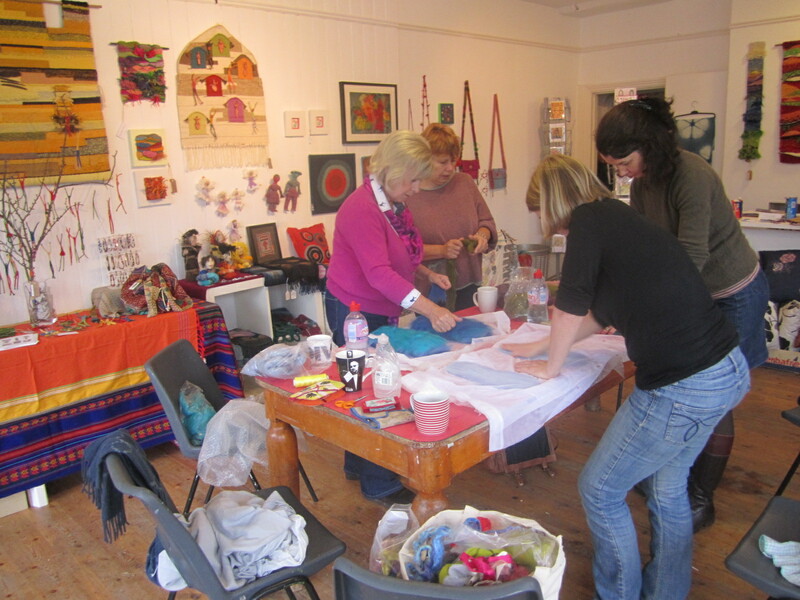 When the summer of workshop fun is over, we Women of the Cloth will be taking part in the Lambeth Open studios weekend on 5th’6th October when we’ll be joined by several other textile makers for a housefull of colourful cloth activity. Watch this space for more details to come. 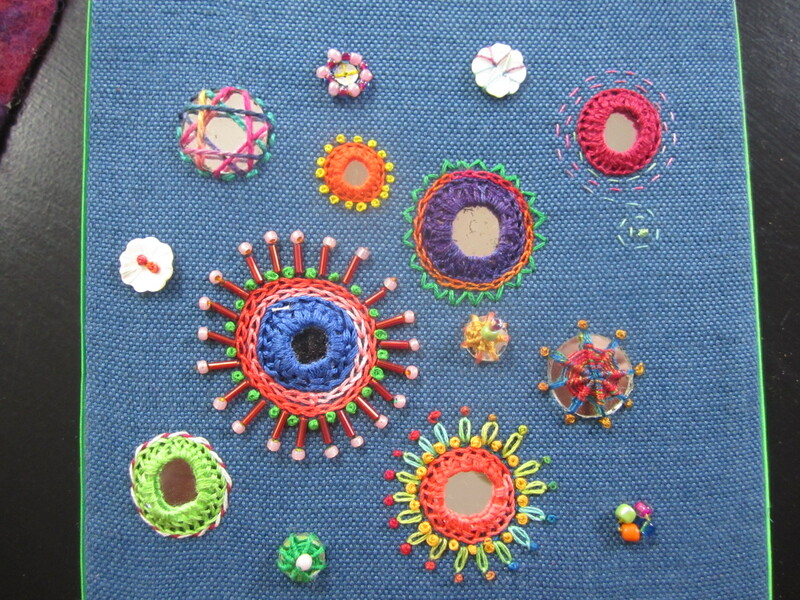 Posted in Dyeing, embroidery, felt, shisha mirrorwork, Uncategorized, Wool, workshops | Tagged Crafty Pint, Lambeth, London, Makerhood, Needlefelting, Streatham, summer, SW16 | Comments Off on A summer of Workshop Fun!